Welcome to this first edition of Life BREWERY newsletter. Featuring key project events, research and dissemination activities and publications, our newsletter will highlight the most important news about Life BREWERY project until the end of the project in 2020. Life Brewery project is financed by the European LIFE programme (LIFE16ENV/ES/000160) with the aim of testing new scalable solutions to re-use brewers’ spent grains and yeast. The use of these new bio-based ingredients in fishmeal can contribute towards business efficiency and profitability and to increase the environmental image of brewery and aquaculture sectors. Brewers’ grain is full of protein, fiber and other nutrients that can be used to make human food, animal feed and nutraceuticals. However, brewers’ grain and yeast are highly perishable and poses an important logistical challenge due to their short life span and the hygienic requirements for high-value applications. The project will aim at optimizing the collection of brewers’ by-products and scaling up a low-carbon dehydration process to overcome this challenge. 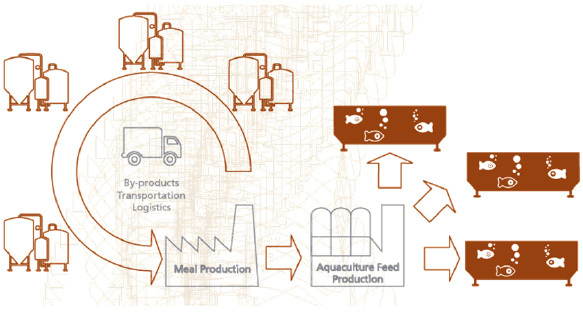 Afterwards, to respond to the increasing demand of alternative raw materials for replacing the marine origin ingredients, aqua-feed formulas will also be optimized to maximize the amount of brewers’ by-products that can be included in the diet of farmed fish. This project has the ambition to replace 15% of aquafeed that is currently fish meal, resulting in reduction of 25 % of the environmental impact associated with aqua-feed production. Additionally, the project will contribute to create up to 50 new employees linked to this new valorization activity. By adding value to food by-product, the project is targeting one of the priority areas of the EU circular economy action plan. Life Brewery project is financed by the LIFE programme. The project consortium members are AZTI as coordinator, IRTA (Spain), Riera Nadeu (Spain), LKS (Spain) and The Brewers of Europe (Belgium). The project began the 1st September 2017 and it will be finished by the end of 2020. Up to date, the main efforts have been focused on initial administrative issues and launching of project’s communication channels. The voice of brewery and aquaculture value-chain are utmost of importance for the final success of the project. Hence, Life Brewery invites stakeholders to participate in our complimentary Life Brewery Sprint on 14th March 2018 at 14:00 hrs Brussels time. The Life Brewery is a 3 hours workshop in Brussels, Belgium in which ideas will be jointly developed to tackle circular Brewers’ grain and yeast problem better. Are you ready to join?